It’s a new year, and now I “get” to start talking about movies from 1915, but I’m not even done with 1914 yet! The next few days will be catch-up, as I prepare to post the nominations for the Century Awards. Expect some other new features as we move into the New Year. 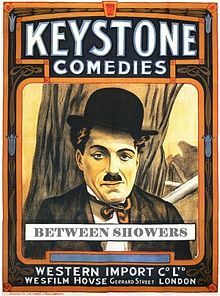 This movie is a simple farce about a stolen umbrella, a girl, and a policeman, which shows the comic abilities of several of Keystone’s stars, but is today mostly known for Charlie Chaplin. Chaplin and Ford Sterling (also in “Mabel’s Dramatic Career” and “Tango Tangles”) are rival “Mashers” after the same girl, Emma Bell Clifton (who was in “Making a Living” and “A Robust Romeo”), who is more interested in Chester Conklin (from “Mabel at the Wheel” “Mabel’s Strange Predicament”), the policeman. Ford tries to wow her by offering her the umbrella he stole off Chester earlier in the film, then demands it back when his affections are not returned, leading to a slapstick fight that ultimately draws in the whole cast. Much of the action takes place in a park near to Keystone Studios, which we see in many of these pictures. Chaplin is in his “Little Tramp” getup, now firmly established, and Ford and Chester are also in goofy and memorable makeup that adds to the sense of being in a silly sort of world. There’s an interesting “mirror bit” in which Chaplin and another policeman face off and the policeman mimics Charlie’s odd appearance with his fingers and hands.